Another Thing To Love About Kentucky Summers: Grapes! Like everything else this hot summer, grapes have ripened early in Kentucky. Boyd Orchard in Woodford County grew these beauties. They are resting on my grandmother Rona's grape plate. 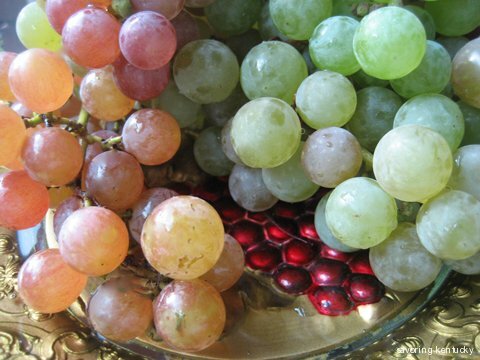 These are seedless champagne grapes, deliciously tart-sweet. Their skins pop just a little when I eat them. After step 3, put the grapes on a small cookie sheet. After step 4, pick grapes off the stems into a small bowl. Add 1 tablespoon creme fraiche, sour cream, full fat Greek yogurt, or Mascarpone cheese. Add two teaspoons excellent Sherry. The world is coming to visit central Kentucky this year for the Alltech FEI World Equestrian Games. To help our visitors know more about Kentucky's food and food ways, Savoring Kentucky is rolling out 116 Savory Kentucky Bites, one for each of the 100 days before WEG begins, and 16 for the days during WEG, September 25 - October 10. Today's Savory Bite is number 39.